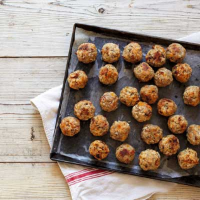 These vegetarian stuffing balls are perfect to accompany a Sunday roast or Christmas turkey. pan and cook the onions and garlic until softened. Tip into a bowl and cool slightly. 2. Stir in the breadcrumbs and remaining ingredients until combined. Season well. 3. Using damp hands, roll pieces of stuffing into 20 golf ball-sized balls. Either arrange them around the turkey for its final 30-40 minutes of cooking, or place on a baking sheet lined with non-stick baking parchment and bake for 20 minutes until golden and crisp.